Irina Rodnina, a Russian politician and described as Russia’s greatest Olympic skater which earned her the honor of lighting the Olympic Torch for the 2014 Olympic games has been exposed as a racist. 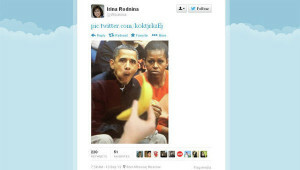 A doctored photo Rodnina posted to Twitter some months back and then quickly deleted showed President Obama and First Lady Michelle Obama sitting on the sidelines of a sporting event staring at a banana that had been added to the phoyo. That photo resurfaced after Rodnina lit the Olympic Torch officially opening the 2014 Winter Olympics hosted in Sochi, Russia. Russian politician Irina Rodnina cited “Freedom of Speech” in defense of her racist tweet of the Obamas. United States ambassador to Russia, Michael McFaul, took to his Twitter account to condemn Rodnina at the time the photo was posted and said the former athlete turned politician is guilty of “outrageous behavior, which only brings shame to her parliament and country.” McFaul stopped short of calling Rodnina a racist. Racist photos of President Obama and First Lady Michelle Obama have been widely circulated among American conservatives since the start of his 2007 Presidential campaign.